Mountains, Desert, Dunes & More! UTV Tours – A Fun, Exciting & Family-Friendly Alternative! 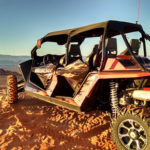 UTV Adventure Tours is St. George and Southern Utah’s premier ATV & UTV Tour Company. We’re proud to offer the “Best in Class” UTVs on the market: Can Am Maverick X3 XRS Turbo R, side-by-sides by Can Am. The Can Am Maverick X3 XRS Turbo R, boasts incredible wheel travel – ready to crawl over large rocks, a lightweight front end for optimal handling, and a low-to-the-ground comfortable & confident ride. Full of power, traction, and great handling, our UTVs come loaded with Bluetooth stereos, tops, doors, front windows, coolers and are ready to ride. Take your UTV Adventure Tour today! A UTV Tour from UTV Adventure Tours offers a great option for families and groups looking to experience a unique 4×4 adventure in southern Utah. You can crawl up boulder fields, go flying through sand dunes, or simply stroll down back-country roads. Whether you want to get your adrenaline pumping or just want a casual and comfortable ride where few get to go, the Can Am Maverick X3 XRS Turbo R is the machine and UTV Adventure Tours is the adventure!